No. 1 Bestseller in Travel with Pets, Dogs, Dog Breeds, World War II, Military, Pets & Animal Care and Travelers & Explorers. 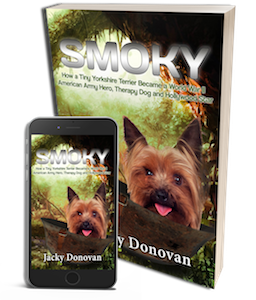 When Smoky, a tiny Yorkie Terrier, is miraculously found in a foxhole in the steaming jungles of Papua New Guinea, she has no way of knowing she will become a World War II hero and Hollywood star. Flying with her new owner, Corporal Bill Wynne, on deadly combat missions, she is soon assisting the war effort, entertaining and bringing comfort to the soldiers with her unique tricks and spirited energy. Based on the true events of the American Army’s wartime struggles and Smoky’s outstanding television career, her moving and uplifting tale is sure to entertain and touch the heart of all who read it.